Outside My Window… it’s damp and slushy. I am thinking… about the remaining gifts on my Christmas shopping list. I am thankful for… seeing friends and family in Ottawa this past weekend, and how great it was to reconnect. From the kitchen... I made chicken divan for dinner tonight. Haven’t made it for a long time and it was a perfect meal! I am wearing… jeans, grey v-neck sweater, black socks. I am going…throw in one more load of laundry this evening so that Alex has some clean running clothes for tomorrow. I am reading… Bitter Medicine by Sara Paretsky. I am hoping… to find peace and calm during Advent. I am hearing… Stephen Colbert interviewing Bob Woodward. Around the house… I was pleasantly surprised to return from a weekend away and find a clean kitchen and vacuumed stairs. One of my favorite things... is walking in from a chilly damp walk to a warm, fragrant home. A Few Plans For The Rest Of The Week: Advent bible study tomorrow morning, Toronto Symphony Orchestra on Thursday (The Planets and Rite of Spring), some baking and Christmas shopping. 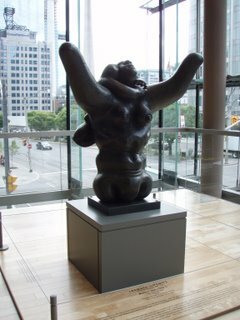 Sculpture titled “Mother and Child II” by Jacques Lipchitz. On display at Four Seasons Centre for the Performing Arts, Toronto.